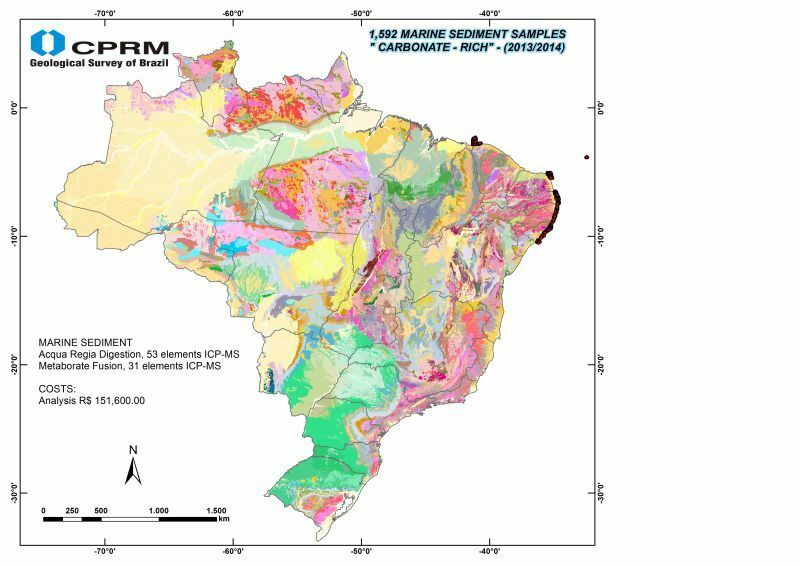 In the last two years CPRM – Geological Survey of Brazil has been conducting regional geochemical mapping surveys from Santa Catarina (South) to Roraima States (North); and from Rondônia (West) to Pernambuco (East). It is also conducting marine sediment sampling in the northeast shore of the country. The focus is on regional geochemical mapping, geochemical exploration and environmental geochemistry. Geochemical atlases are composed from maps and databases providing regional coverages for a given sampling media (soil, stream sediment, heavy mineral concentrate, surficial water). They often cover a large region or 1:100,000 scale map sheets. These data are available free of charge or at a low cost. Please visit www.cprm.gov.br. During 2013 up until October 2014 4,130 soil samples and 20,523 stream sediment samples were collected in continental Brazil. During the same period of time, marine sediment samples were collected in the continental shelf. These samples were analyzed by multielement methods (XRF, ICPOES and ICPMS) using various digestion methods. CPRM also collected 19,742 heavy minerals concentrate samples; these samples were analyzed semi-quantitatively for mineralogical composition. For more details, please see Figures 1, 2 and 3. 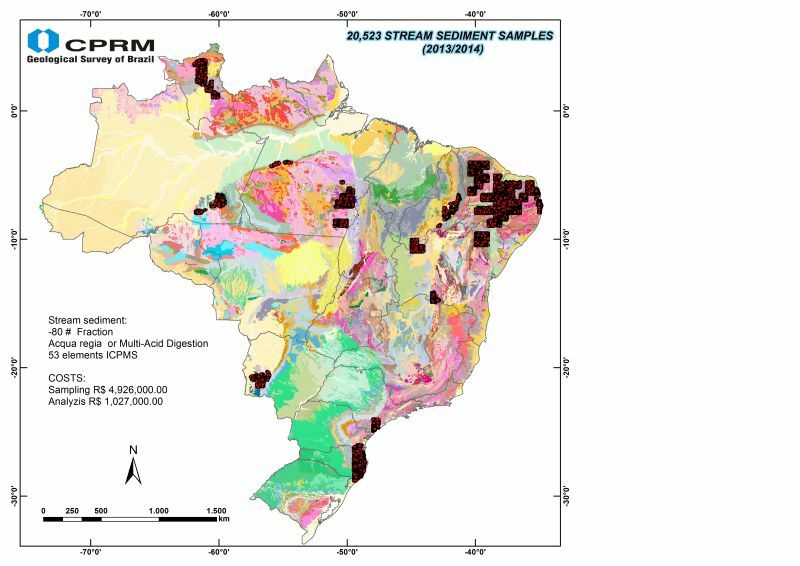 The Brazilian government, through CPRM and its Geology and Mineral Resources Directory invested R$ 10,657,000.00 (about US$ 4,262,800) in sampling and R$ 2,220,500.00 (about US$ 888,200) in analysis for the country. Figure 2 – Stream sediment samples collected between 2013 and 2014. Figure 3 – Heavy minerals concentrate samples collected between 2013 and 2014. 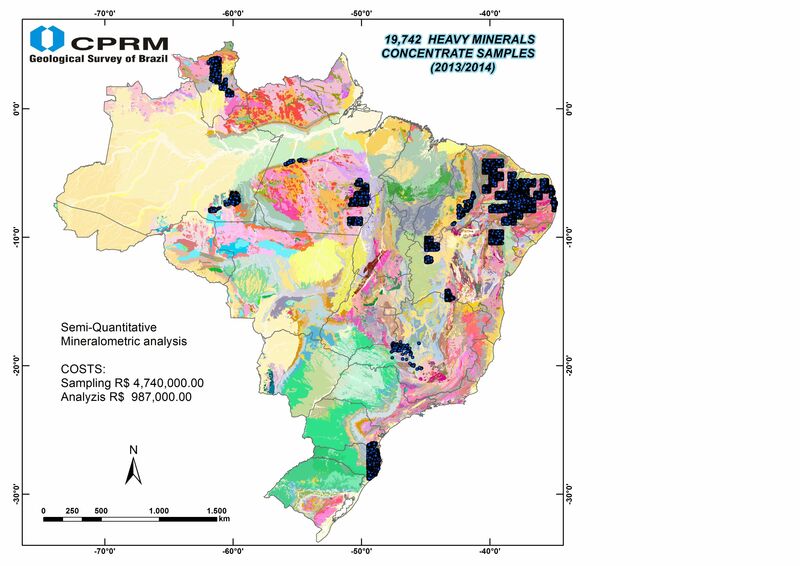 CPRM is investigating the mineral potential of the Brazilian continental shelf. Geological, geophysical and geochemical data are being collected and integrated. The Brazilian Navy and some Brazilian universities are working together in this project. These geological, economic and environmental data will be used by decision makers in order to develop special policies for the safe use of marine resources. See Figure 4 for details. Figure 4 – Marine sediments collected between 2013 and 2014. To download this regional report in PDF format, click here. 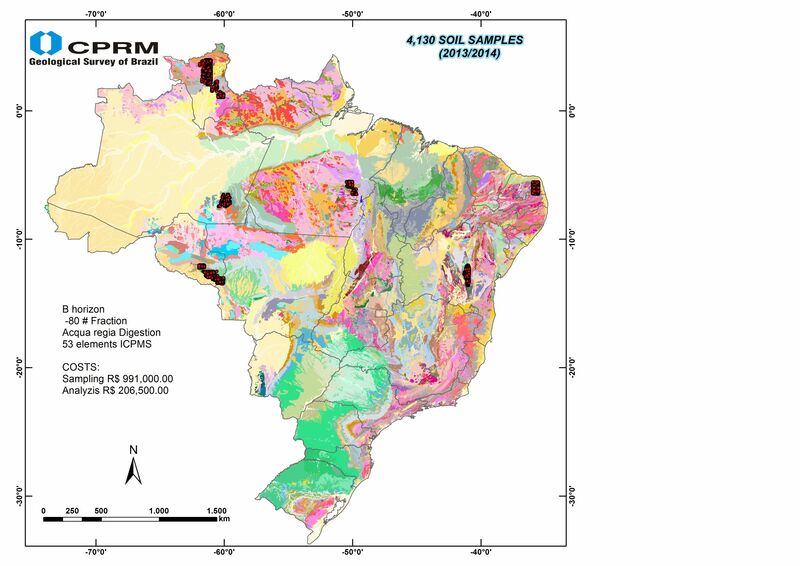 CPRM – Geological Survey of Brazil has been conducting geochemical mapping surveys since 1970s in order to characterise the regolith. Stream sediments, overbank sediments, pan concentrates, soil and water samples are the main sample media collected from Amazon to Pampa regions. Twenty geochemical maps were published in the last two years at 1:100.000 or 1:250.000 scales. Thirty five maps are in press. Twenty five sheets are being sampled. Sampling in seventeen new sheets are about to start in the following months. A special project will be conducted at Carajás Mineral Province and similar projects are also planned. Brazil is experimenting an exciting moment and the Brazilian government raised its investments in geological knowledge. CPRM employed new geochemists and is conducting geochemical studies at various scales with objectives ranging from regional exploration to environmental remediation. Amazon forest and the chestnut tree “castanheira”. One of the landscapes we deal with.